The social customer has existed since commerce has been around – the difference today being that their voice has been scaled insurmountably as a result of the virality of social platforms. As millions of people are flocking to social media to voice concerns, the importance of social customer service has followed suit as another precaution to avoid social crises, something which is taking a front seat in brands’ marketing strategies today. We took a look at how brands are excelling their social strategies while aligning it with bottom-line objectives. This increase in demand follows the simultaneous development of a social savvy and technological culture. Naturally, companies are following their target audience and thus creating their own customer service social community. Of the InterBrand top 100 brands on Twitter, 32% have dedicated customer service handles – 13% of whom respond to 50+ inquiries per day. To further humanize the brand, in several cases customers have the ability to actually put a name to whom they are talking as a lot of companies tend to sign their tweets with the corresponding customer service rep’s initials. 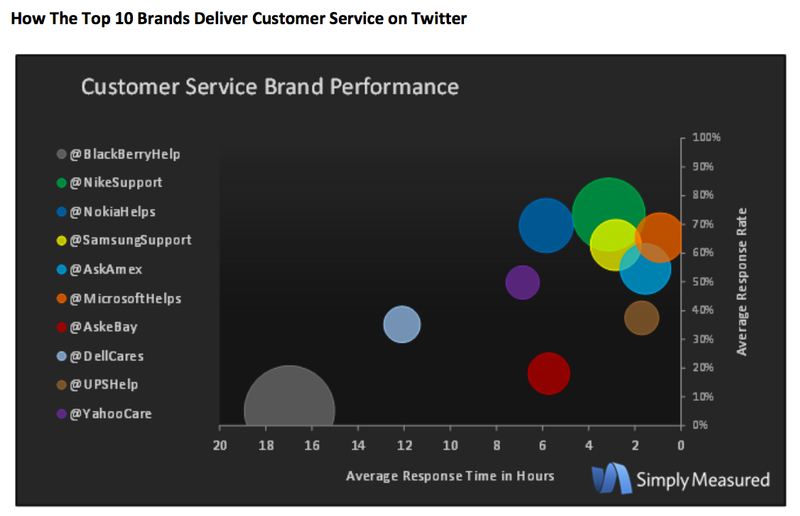 A recent SimplyMeasured study analyzed the activity of the top 10 brands who have a dedicated Twitter handle solely for customer service purposes. The conducted research looked at all facets of customer service including average response time and rate. As the question arises of how companies are using this free platform to its customer-service objectives – only a handful are doing it well. As noted below, the difference between the top performing brand, @NikeSupport and the biggest underachiever, @BlackBerryHelp, is very distinct. At the time of the study in Q3 of 2013, an average response rate of 14% and response time of 17 hours helped Blackberry’s customer service performance align itself with the downward spiral of its sales figures. 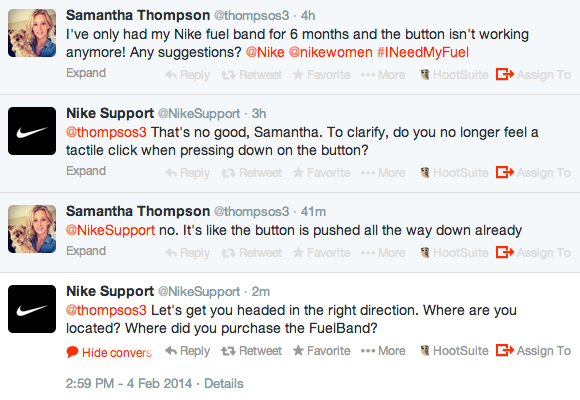 Nike support, on the other hand, are dictating the industry standard regarding both time and rate. How does this response to high ‘social care’ demand have an effect on the bottom line? According to a recent study, 71% of consumers who experience a quick and effective brand response on social media are likely to recommend that brand to others, compared to just 19% of customers who do not receive a response. While knowing that brand advocates are said to drive 33% more sales and 18% more traffic than regular customers, the name of this game is word of mouth. Social customer support it’s the latest phenomenon when nurturing customer relationship management and avoiding, at all costs, a social crisis escalation. When asked about buy-in from C-suite, Stoutenburgh argued that often the individuals making the budgeting decisions are themselves not active on social media, which tends to be the major obstacle. “They still think Facebook is only for their teenage son or daughter. They are also fearful of blunders because they are so widely publicized.” The effective way to tackle this is developing an extensive social marketing strategy, including ingraining your brand’s culture with social escalation procedures. The most cost-effective way to achieve this is via tailored social crisis management and CRM training. This offers grounds for clear and precise escalation procedures to be put in place, while sustaining a strong brand image and aligning it with your bottom-line objectives. Who do you think is providing the best social customer support? More importantly what are they doing that others aren’t to provide value?